Here at ChiIL Mama, we're pleased to partner up on a sponsored post with Ovation Brands. 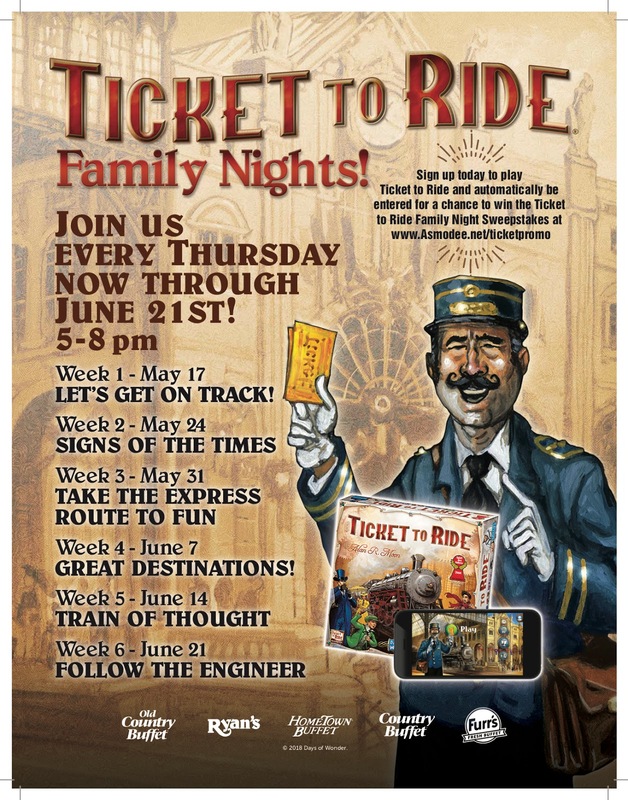 They're providing one of our lucky readers with Complimentary Dinner For 4 and a Free Ticket to Ride Game Download (Approximate value up to $58). Enter at the bottom of this post through midnight on June 12th, 2018. Open nationwide anywhere there's an Old Country Buffet, Ryan’s, Hometown Buffet, Country Buffet or Furr’s Fresh Buffet. Ovation Brands’ restaurants and Furr’s Fresh Buffet are running a new Family Night promotion featuring the popular game, Ticket to Ride. This board game, which is also digitally available, can be learned in under 15 minutes while providing players with intense strategic and tactical decisions every turn. Players collect cards of various types of train cars they then use to claim railway routes in North America. The longer the routes, the more points they earn. Additional points come to those who fulfill Destination Tickets – goal cards that connect distant cities; and to the player who builds the longest continuous route. Each Thursday, from May 17th through June 21st between 5 p.m. and 8 p.m., kids may participate in different interactive and educational activities at Old Country Buffet, Ryan’s, Hometown Buffet, Country Buffet – and Furr’s Fresh Buffet locations. PLUS kids eat for $1.99 from 4 p.m. to close with the purchase of a regular-priced adult or senior meal. Prize includes the following: four (4) free meal passes for you and your family to enjoy a meal at any of Ovation Brands’ locations as well as one (1) Ticket to Ride Digital Game Download Code. Enter through midnight June 12, 2018. One of ChiIL Mama's lucky readers will win. Disclosure: Thanks to Ovation Brands for partnering with on this sponsored post and providing us with meal passes and game tickets for our winner and for review purposes. As always, all opinions are my own.